This Guide provides students with the scholarly and interpretive tools they need to understand Hume's A Treatise of Human Nature and its influence on modern philosophy. A student guide to Hume's A Treatise of Human Nature. 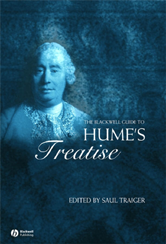 Focuses on recent developments in Hume scholarship. Covers topics such as the formulation, reception and scope of the Treatise, imagination and memory, the passions, moral sentiments, and the role of sympathy. All the chapters are newly written by Hume scholars. Each chapter guides the reader through a portion of the Treatise, explaining the central arguments and key contemporary interpretations of those arguments.